A capacity crowd turned out for the Sir Zelman Cowen Twilight Lecture series to discuss how Royal Commissions shape public policy. Moderated by Professor David Weisbrot AM (former President of the Australian Law Reform Commission), the Davos-style lecture explored the complexities and responsibilities that come with the pursuing solutions to some of our nation’s biggest challenges. Professor Kathy Laster, Director Sir Zelman Cowen Centre. Adjunct Professor Alan Kohler, financial journalist and former editor, The Age. “...not just about the terrible things that had happened to individuals but the hope that we could make things better for other people, in the future”. More information about future events is available through the Sir Zelman Cowen Centre. Royal Commissions: How do they shape public policy? Royal Commissions: How do they shape public policy? is a public lecture exploring how the methods and approaches of royal commissions have gained the public’s trust. Professor Peter Dawkins became the third Vice-Chancellor and President of Victoria University in 2011. In 2017 he received an Officer of the Order of Australia (AO) as part of the Queen’s Birthday Honours. Professor Dawkins was born in the UK and holds a BSc and PhD from Loughborough University (of which he became a Distinguished Alumnus in 2012). He also holds a MSc (Econ) from the University of London. He came to Australia in 1984 and became an Australian Citizen in 1988. He was Curtin University’s first Professor of Economics from 1990 to 1995 and the Ronald Henderson Professor and Director of the Melbourne Institute of Applied Economic and Social Research at the University of Melbourne from 1996 to 2005. From 2005 to 2010 he held senior positions in the Victorian Public Service, including Deputy Secretary of the Department of Treasury and Finance and Secretary of the Department of Education and Early Childhood Development. Victorian Education and Research Network (VERNeT). Professor Dawkins is also the Deputy Chair of the West of Melbourne Economic Development Alliance, which was created with a view to developing an overarching economic growth strategy for Melbourne’s West, invigorating the region and addressing problems of population growth and employment by adding concrete skills and clear pathways for industry and development. He is also part of the West of Melbourne Advisory Committee, and the Vice-Chancellor Industry Advisory Board. Professor Dawkins has developed and led the implementation of the 2012-2016 strategic plan, in which VU has positioned itself as the ‘University of Industry and Community’, ‘Australia’s Leading Sport University’ and most importantly, the ‘University of Opportunity’ - helping students from diverse countries, cultures, socioeconomic and educational backgrounds, to find true success. 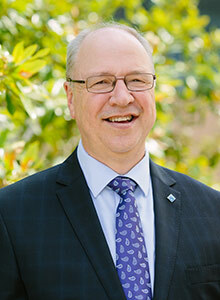 In 2015, the University Council extended his appointment as Vice-Chancellor and President of Victoria University for a further five years, and he released a strategic plan which leads Victoria University into the 21st Century as the ‘University of Opportunity and Success’, building on the core promise to deliver learning opportunities for people from diverse backgrounds and ensure they find their own personalised success as measured by their employability, entrepreneurial mindset, and contributions to industry and community. Peter is a Fellow of the Academy of the Social Sciences in Australia, a Fellow of the Institute of Public Administration Australia and an Honorary Fellow of the Australian Council of Educational Leadership. He is married to Susan Sleep and has a daughter and a son, Emily and Mark. He is a keen sports enthusiast. Having been a club cricketer and a coach, he continues to follow cricket with keen interest, is an occasional golfer, and follows the Western Bulldogs in the AFL, one of the University's important partners. Alan Kohler, one of Australia’s most experienced financial journalists, will take on a new role as adjunct professor in VU's College of Business.